Runners Lab strives to help runners and walkers practice their sports injury free, comfortably and with pleasure. Runners’ lab was founded in 1980 enabling people to keep running, free of injury. Advising the right shoe is sometimes not good enough. we offer orthotics because this enables us to provide work that is truly tailored to individual needs. a team of skilled orthopedic technicians, podiatrists and physiotherapists are ready to give the proper professional advice. More than 35 years of experience! 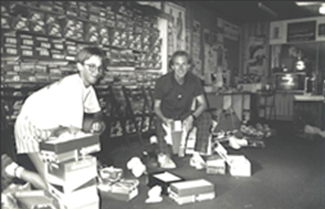 In 1980, years before the running hype, Runners Service Lab (now runners’ lab) opened the first running specialty store in Belgium. Our technology used to design and develop running shoes and orthotics based on a dynamic footscan® formed the basis of our success. Our technology is still evolving and improving everyday. Over the years, runners’ lab has made significant contributions to the development of the footscan® technology and analysis. Runners' lab has its own workshop where it has developed and manufactured its orthotics and insoles since day one. Originally in Beveren and since 2011 in Zwijndrecht. For our analysis we use a patented 2 meter footscan® plate. This pressure measurement system is a successful international project of Jempi Willsens, the founder of RSLAB in 1980 and owner of rsscan international. See you soon in one of our stores. runners’ lab is the place to be for professional advice on functional footwear, orthopedic modifications and custom orthotics!